In 1998, Tracy and some of her friends from the Tatamagouche area started the North Shore 4-H club, where she held the position of General Leader for 11 years. In addition to being general leader, she was also a project leader for poultry, gardening and exploring 4-H. She has chaperoned local tours, judged public speaking, organized county rallies and continues to judge when called upon at various 4-H events. In most cases the general leader of a 4-H club would be someone who has been involved for years, but for Tracy that wasn’t the case. In 1998 she became general leader without ever being involved in 4-H.
“It was probably better that I wasn’t in 4-H because as a group we learned everything from the ground up. We didn’t know the annual schedule, so we just learned as we went, as a group. I believes it made us stronger, as we were all learning together and having fun while doing it,” she explains. Tracy graduated from Nova Scotia Agricultural College, now Dalhousie Faculty of Agriculture in 1996 with a BSc (Agriculture) in Plant Science. She rejoined the Agricultural Campus 10 years later, in the summer of 2006, when she became a program manager with Extended Learning. From producers to farm employees, agricultural companies to commodity groups, Tracy works with them all. 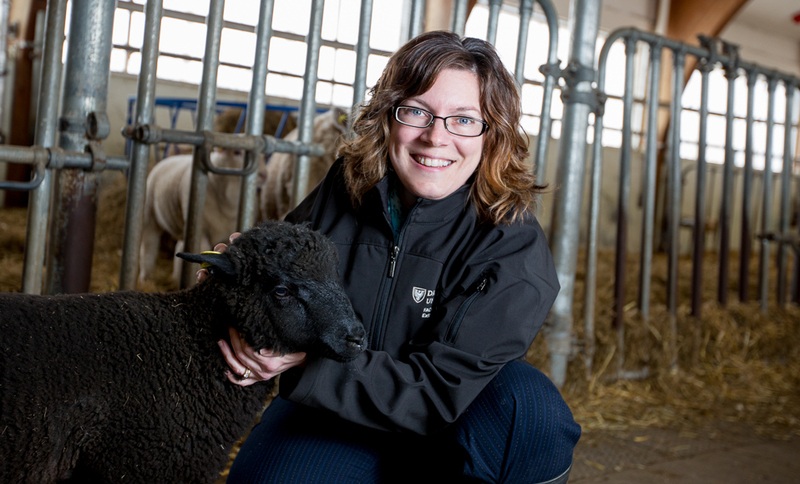 Tracy runs the PEI Farm Technician Apprenticeship program, in Prince Edward Island during the winter. This two year program offers a one-of-a-kind experience, combining classroom learning with on-farm experience. You'll occasionally find her in the Ruminant Animal Centre (RAC) cuddling the lambs and visiting with co-workers. “It’s different every day. I really like the fact that I get to network with producers, producer groups and alumni, from all across the region. It’s never the same thing day in and day out, that’s probably why I’ve been here for 10 years, it is very rewarding to bring folks in the industry together to learn,” Tracy says. “I was always one of those who believed, a better opportunity was going to come along. It might not be quite the right one but I never knew that, so I always took that opportunity to go try something different. Eventually it led me here and I think I’ve been here this long because it finally jelled." If balancing being on a provincial board, community hall, two kids, a full time job, playing the fiddle and riding her horse wasn’t enough, in April Tracy begins her Master’s in Adult Education through Saint Francis Xavier University. But for Tracy, it’s enough.